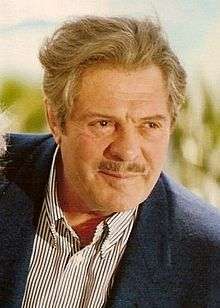 Marcello Vincenzo Domenico Mastroianni, Knight Grand Cross (Italian pronunciation: [marˈtʃɛllo mastroˈjanni]; 28 September 1924 – 19 December 1996) was an Italian film actor. His prominent films include: La Dolce Vita; 8½; La Notte; Divorce, Italian Style; Yesterday, Today and Tomorrow; Marriage Italian-Style; The 10th Victim; A Special Day; City of Women; Henry IV; Dark Eyes; and Stanno tutti bene. His honours included British Film Academy Awards, Best Actor awards at the Cannes Film Festival and two Golden Globe Awards. Mastroianni married Flora Carabella (1926–1999) on August 12, 1950. They had one daughter together, Barbara (born 1952), but eventually separated because of his affairs with younger women. Mastroianni's first serious relationship after the separation was with Faye Dunaway, his co-star in A Place for Lovers (1968). Dunaway wanted to marry and have children, but Mastroianni, a Catholic, refused to divorce Carabella. In 1971, after three years of waiting for Mastroianni to change his mind, Dunaway left him. Mastroianni had a daughter, Chiara Mastroianni, with French actress Catherine Deneuve, who was nearly 20 years his junior and lived with him for four years in the 1970s. During that time, the couple made four movies together: It Only Happens to Others (1971), La cagna (1972), A Slightly Pregnant Man (1973) and Don't Touch the White Woman! (1974). ↑ Rothe, Anne; Maxine Block; Charles Moritz; Marjorie Dent Candee (1958). Current Biography Yearbook. Hw Wilson Co. p. 261. 1 2 3 4 5 6 7 Castro, Peter (13 January 1997). "Lover and Legend". People magazine. Retrieved 1 January 2010. ↑ "Marcello Mastroianni, known as 'Latin Lover,' dies". CNN. 19 December 1996. Retrieved 1 January 2010. 1 2 "Actor dies at age 72". The News (Boca Raton, Florida). Associated Press. 20 December 1996. p. 4A. Retrieved 1 January 2010. ↑ Wiegand, Christopher. Federico Fellini: ringmaster of dreams, 1920–1993. p. 83. ISBN 978-3-8228-1590-8. 1 2 3 4 "Family Feud". The Southeast Missourian. 30 August 1997. Retrieved 1 January 2010. 1 2 3 4 5 6 7 8 "Marcello Mastroianni >> Awards". Variety. Retrieved 1 January 2010. 1 2 3 "Awards". Internet Movie Database.